Tulip 2 Hotel is white, bright and the glossy floor glares like new. The hotel has a great central location at the top of the stairs overlooking the central market and is a short walk to the lake. The English-speaking reception staff are friendly and helpful. Rooms have a lot of positive notes: they are big, well lit, have bedside table with lamps, outlet and master switch, a kettle, mini fridge, vanity, flatscreen TV, fast WiFi, sitting area and luggage stand. Bathrooms are very small but showers are a decent size, have piping hot water and good water pressure – turn it on maximum and it could blast paint off the walls. Light sleepers take note: If you want to sleep with the windows open then noise will be an issue given Tulip 2’s location facing a busy street. Breakfast is not included – Dreams 3 Hotel does and is the same price. The big downside to Tulip 2 Hotel is the linens which are made of a synthetic poly-cotton blend. They are scratchy, hot and very uncomfortable. It’s an unusual, cheap choice which is unfortunate because this hotel would otherwise be recommendable. 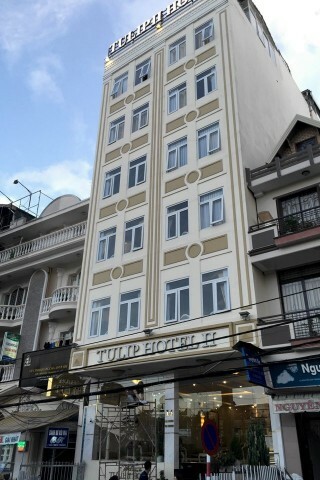 Check rates at Tulip 2 Hotel on Booking.com.